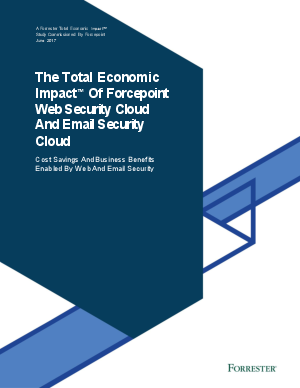 The Total Economic Impact™ Of Forcepoint Web Security and Email Security, a commissioned study conducted by Forrester Consulting on behalf of Forcepoint, shows how a prominent manufacturing company experienced a ROI increase with Forcepoint after switching from another cloud vendor. An ROI of 122% within a payback period of 6 months. Security breach reduction cost savings of $743,000. With an estimated cost of $3.25 million per breach and a starting risk level of 25%, the organization saved $743,000 over three years. Productivity gains up to $152,000. Company reported that they have benefited from the reduction in time spent managing malware and phishing incidents. Discover the potential impact of Forcepoint Web Security Cloud and Email Security Cloud on your organization!